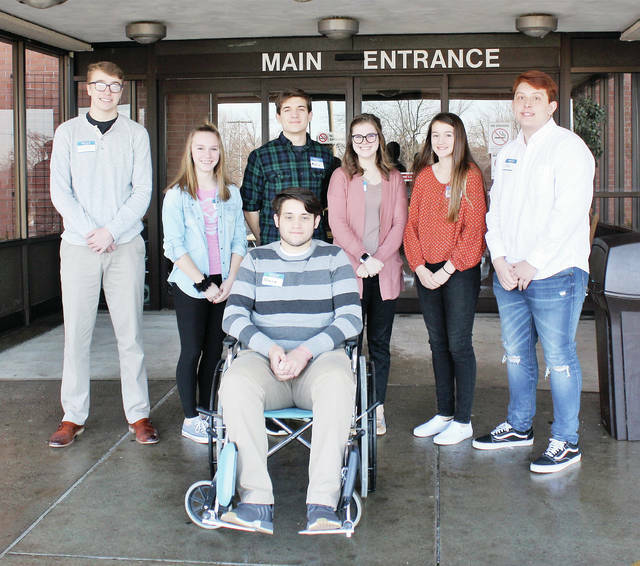 Students participating in the 22nd Annual Fulton County Health Center Health Care Camp were, from left, Kallen Brown and Kelly Limbaugh of Ayersville High School, Andrew Pile of Wauseon High School, Mackenzi Rivera of Pettisville High School, Jordan King of Wauseon High School, Jose Aguilar of Fayette High School, and, seated in the wheelchair, Owen King of Wauseon High School. Fulton County Health Center held its 22nd Annual Health Care Camp on Feb. 3. Students at the event discussed health care careers, changes in the health care culture, and basic competencies, took an educational tour of the facility, and considered ways in which FCHC can help prepare a students with opportunities for job shadowing or volunteering. The facility has now had 123 students complete this camp, representing 20 different high schools or colleges. Health Care Camp began in 2015, and meets several times per year. It is offered as a way to support and encourage the next generation of healers. The camp is the gateway to volunteering or job shadowing opportunities at FCHC. There are currently more than 20 students who volunteer or make use of job shadowing options. The camp is free but limited to the first 10 students who register. The next camp will be held Sunday April 7. There are summer camps scheduled for June 27 and Aug. 7. Interested students can contact Mary Gautz at 419-330-2695 or visit mgautz@fulhealth.org for a reservation form. Supportive adults, parents, teachers, and counselors may call with questions, but allow the students to make their own reservations. https://www.swantonenterprise.com/wp-content/uploads/sites/23/2019/02/web1_health-care-camp.jpgStudents participating in the 22nd Annual Fulton County Health Center Health Care Camp were, from left, Kallen Brown and Kelly Limbaugh of Ayersville High School, Andrew Pile of Wauseon High School, Mackenzi Rivera of Pettisville High School, Jordan King of Wauseon High School, Jose Aguilar of Fayette High School, and, seated in the wheelchair, Owen King of Wauseon High School.